User-friendly, easy-to-use, modern gamebook editor! Gamebooks are a special kind of books in which the protagonist is none else than you. You impersonate a character and make choices for him, and each different choice may lead you to different results: will you succeed in defeating the main enemy or will you lead your character to an early death? When you discover the evil plans of a secret organization, will you fight them or join them? These are only some examples of the situations you can find yourself in while reading a gamebook. Does it sound fun? We think it does! That is why we are giving you the opportunity to write a gamebook by yourself using our Divine Gamebook Creator. Check below to see all the features of our editor, or click here to see a demo book showing most of the features included in our software! NEW! The Developer Edition has been released! Click here to see what's new. You will receive an email with the link to the program as soon as the payment is processed. If you don't receive it in 30 minutes, check your spam folder and if you still can't find it email us at info@divinegames.it. If you already bought the Standard Edition and would like to upgrade to Developer Edition, click here. 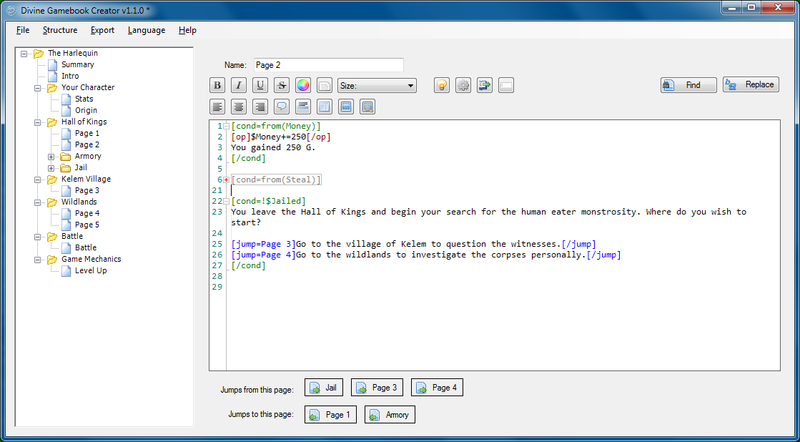 Write long stories easily in a full-featured text editor, with easy to use bbcode-like language. Use the powerful condition system to create variables that persist through pages and lead to different outcomes. You can even create a full RPG-like system with it! An useful syntax check will help you while creating the pages, highlighting errors in realtime while you write. Click here, here and here to see to see example screenshots! 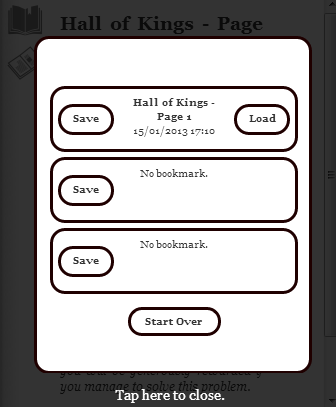 You can export your book in a self-contained HTML, RTF or PDF file and share it with anyone that wants to play it! The editor itself supports Microsoft™ Windows© XP SP3, Vista, 7 and 8. 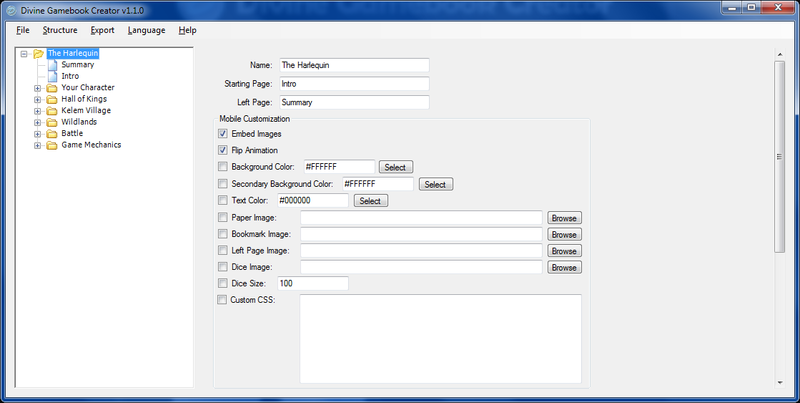 The HTML files you export can be viewed in any HTML5-compliant browser, even on smartphones! The editor automatically check for updates every time it starts, so you always get the latest version without any effort! This edition has been created specifically for the more demanding, creative and experienced developers. Its new features include exporting in an HTML format optimized for mobile devices, dice roll animations, save slots and tons of customization options. Click here to see a demo book showing the new features of the Developer Edition! Now you will be able to export your books in a format optimized for smartphones and tablets. You will be able to share or sell your adventures on all mobile devices! You can now customize every graphic aspect of your book with the new CSS interface, or use our shortcuts to change the basics if you are not experienced enough. Fancy a new graphic perk showing real rolling dices? Now you can have it. 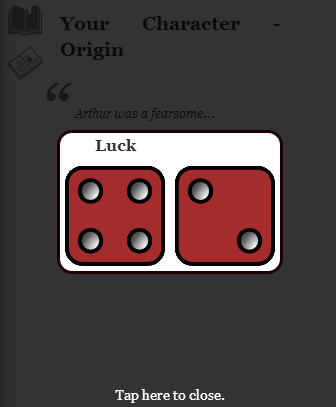 With a simple command, you can generate any number of dice, simulating a real roll animation. 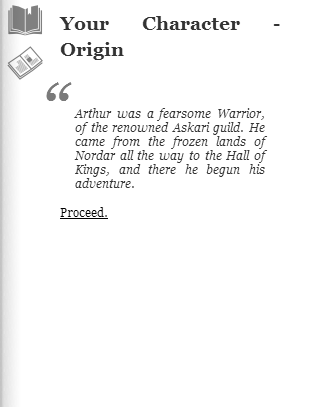 When autosaves are not enough, give your readers an option to save and load their adventures whenever they wish. Create new difficulty levels by adding or removing save slots!